Gordon was using the living room computer to explore some art with Karen, and Sukkie decided that Gordon's lap was the perfect napping spot. 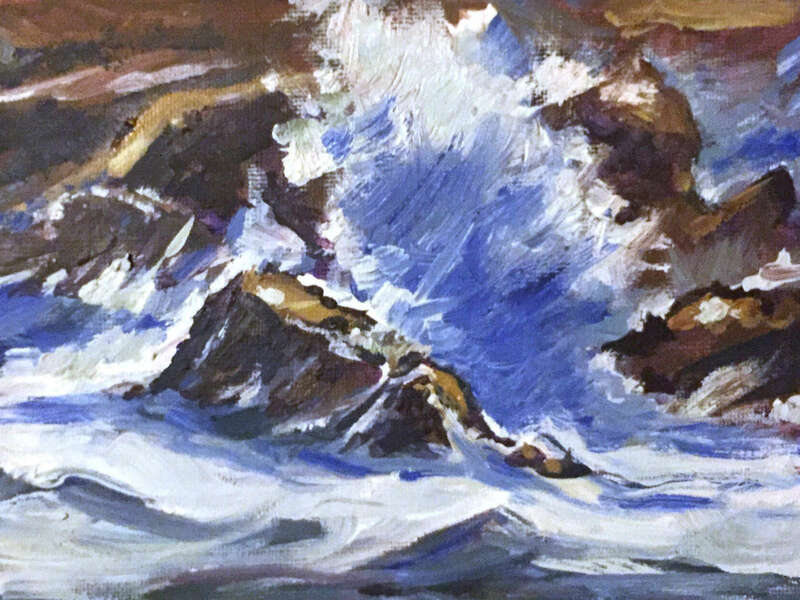 A seascape by Karen, one of her daily paintings. 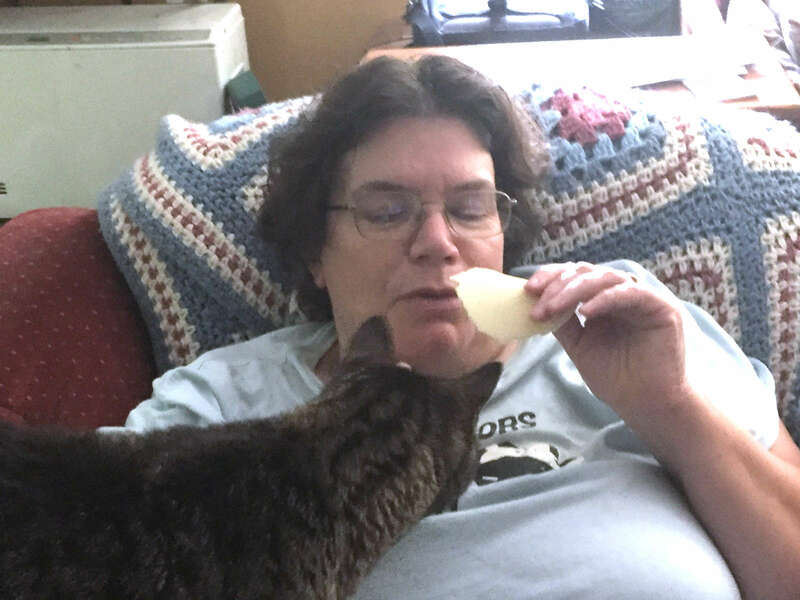 Karen sat down to enjoy a slice of cheese, and immediately had company. Yes, Sukkie did get a few bits of cheese. 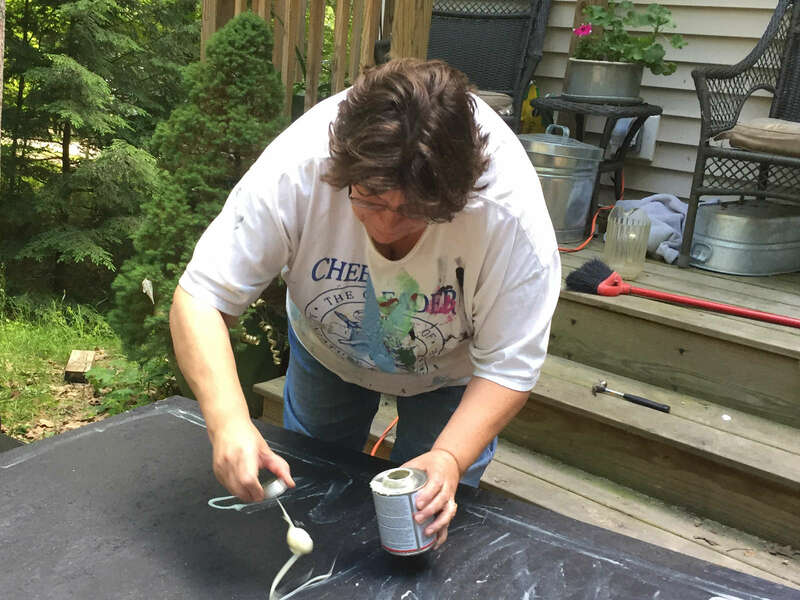 Karen gets in a little morning painting before going to work. 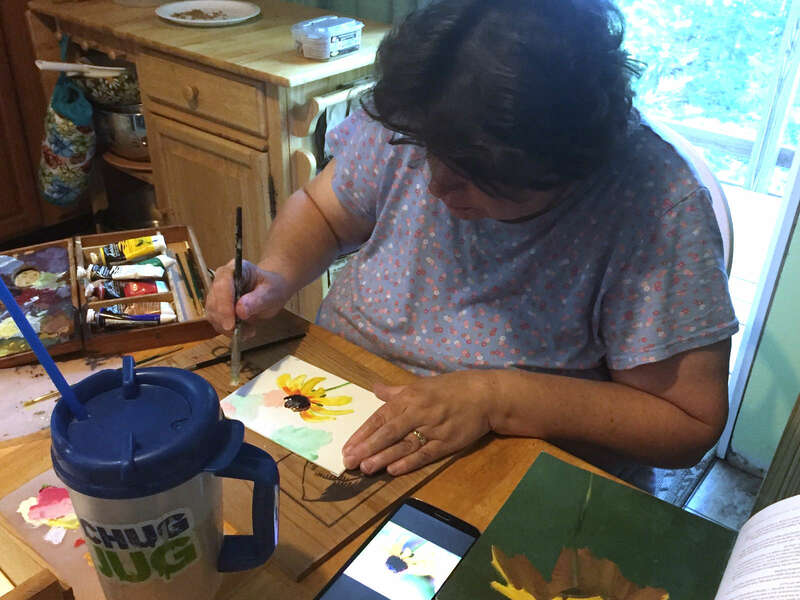 She's trying to average a painting a day to hone her skills. Daniel cuddles with Ambush to comfort her after her morning pill. She gave us quite a scare, but she's recovering nicely and is mostly her old self now. 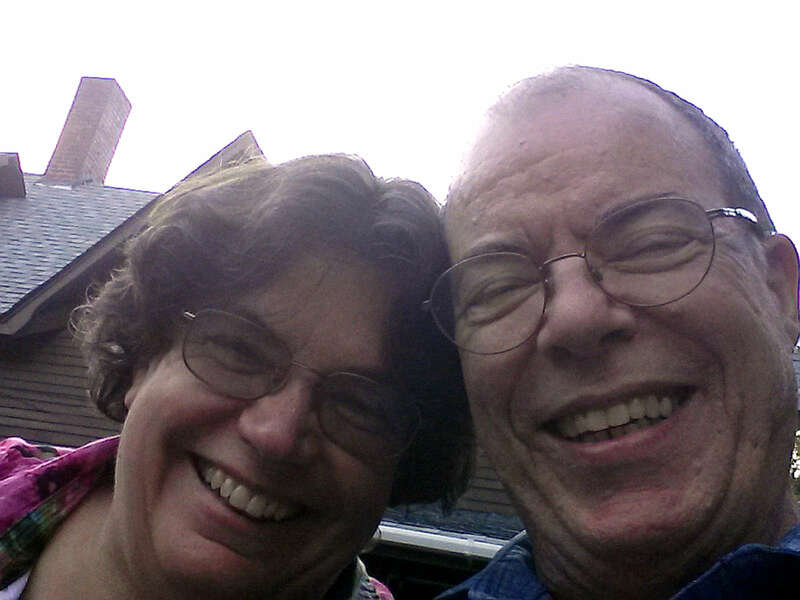 Karen and Gordon pose for a selfie in front of one of their favorite restaurants, a pan-Asian establishment known as East of Suez. 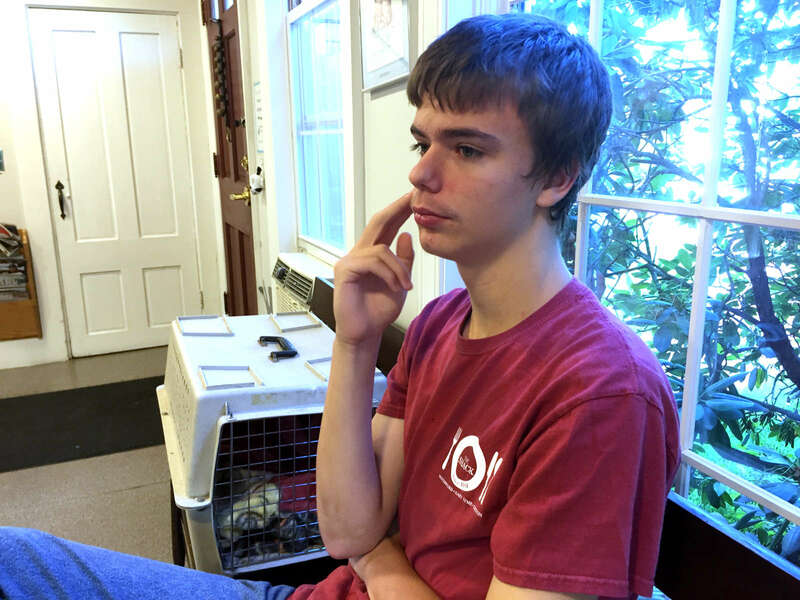 Daniel sits with Ambush, who is hiding under the blanket in the crate waiting to get her blood drawn. She is doing much better; we just need to monitor her to ensure we are doing her treatments right. 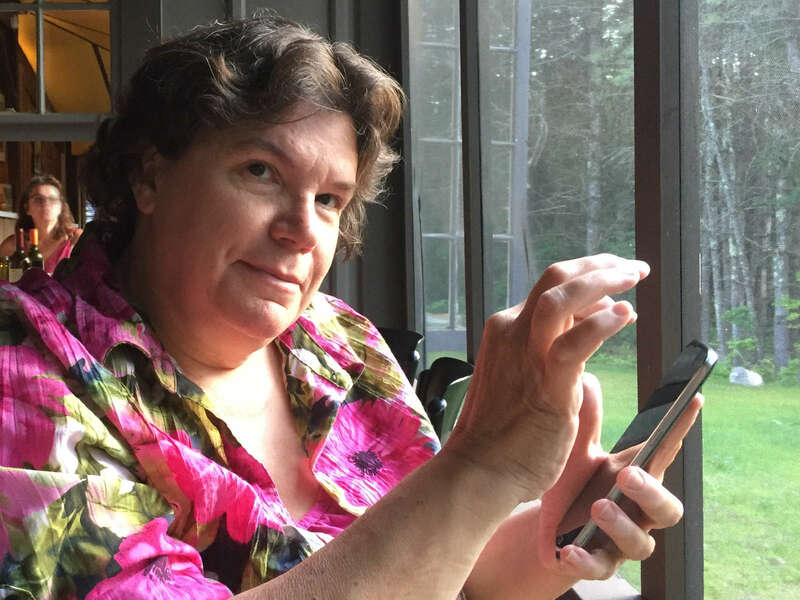 While out for an anniversary dinner, Karen, ever the artist, saw something that caught her eye and took a picture for inspiration. 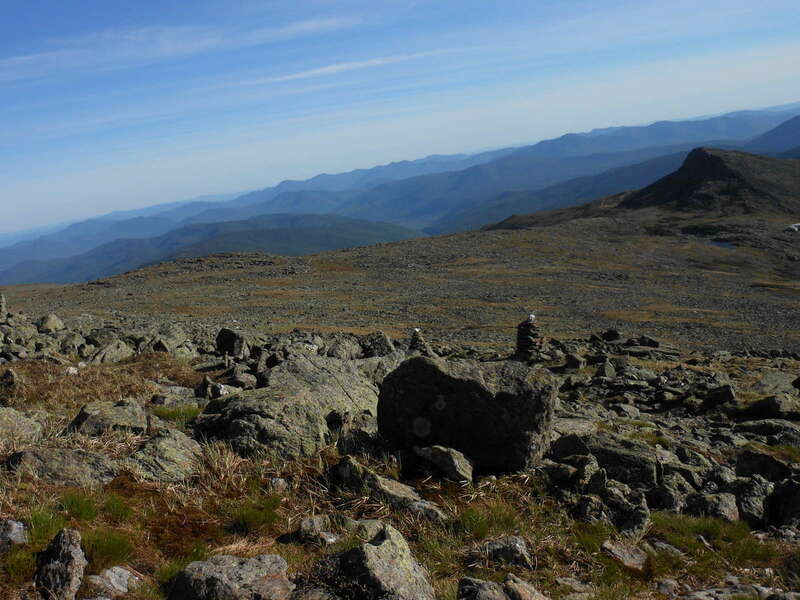 Gordon, ever the loving husband, saw something that caught his eye, and was likewise inspired to take a picture. 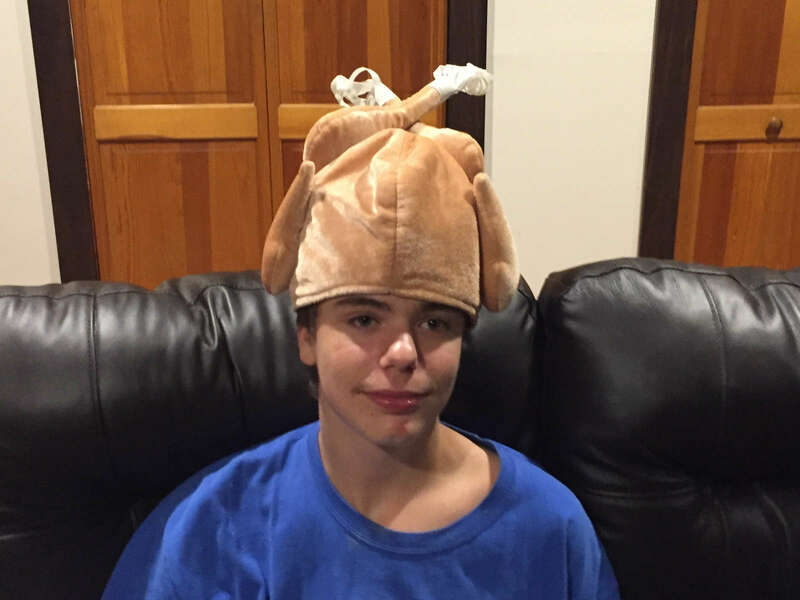 Daniel puts on a chicken hat at a barbecue we attended, forgetting that Dad always has a camera in his pocket. 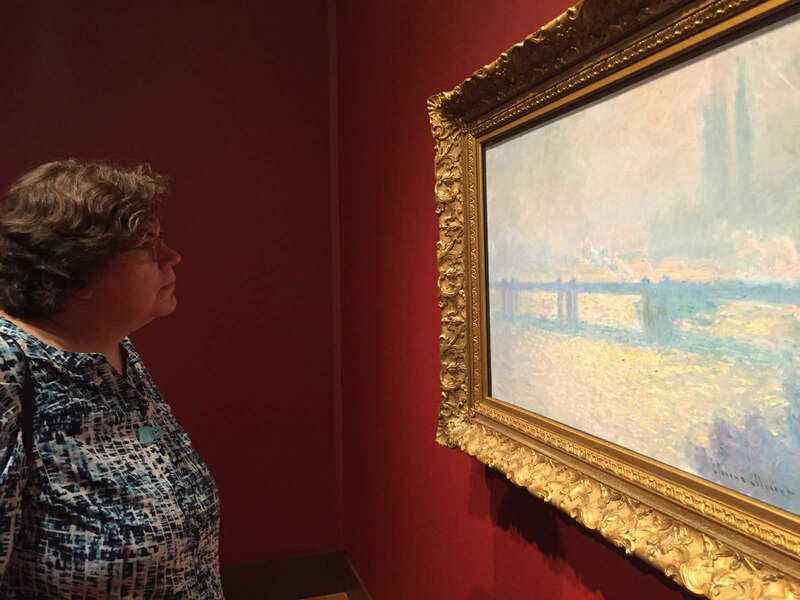 Karen marvels at one of Monet's London cityscapes. 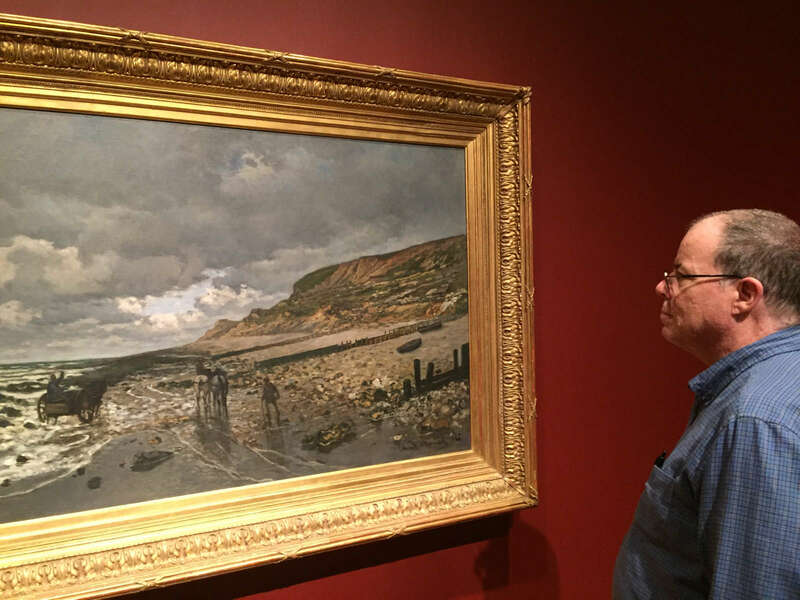 Gordon contemplate the amazing technique of Claude Monet at the Currier museum in Manchester. 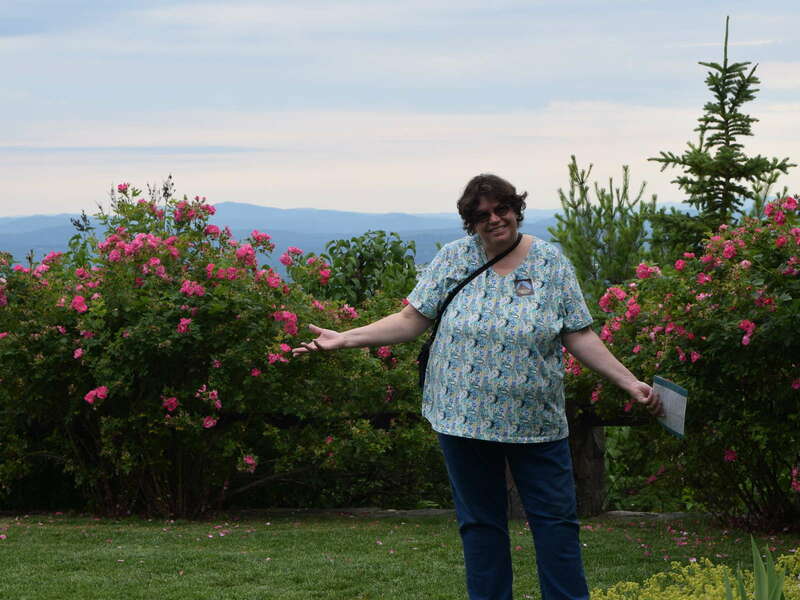 Karen in the gardens at the Plante Estate in Moultonborough. 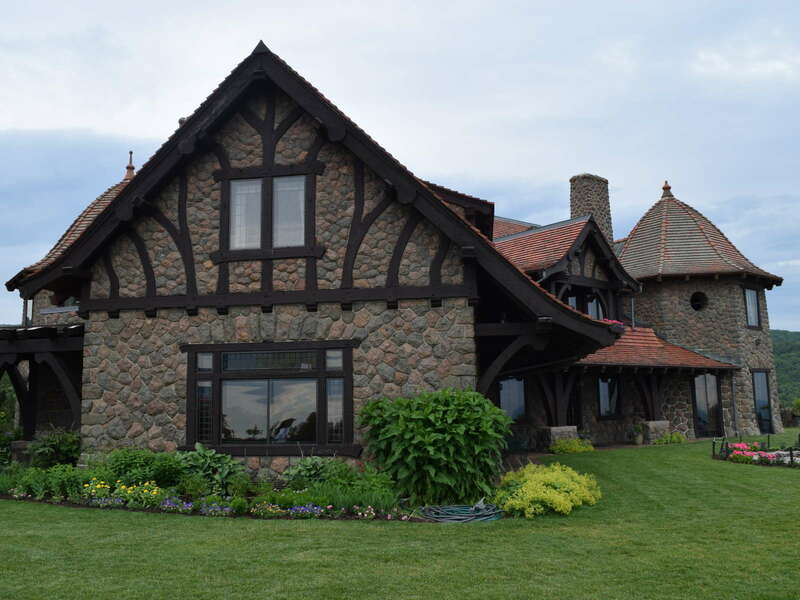 The Plante Estate, built in 1914, dubbed Lucknow by its first owner, and now known as The Castle in the Clouds. 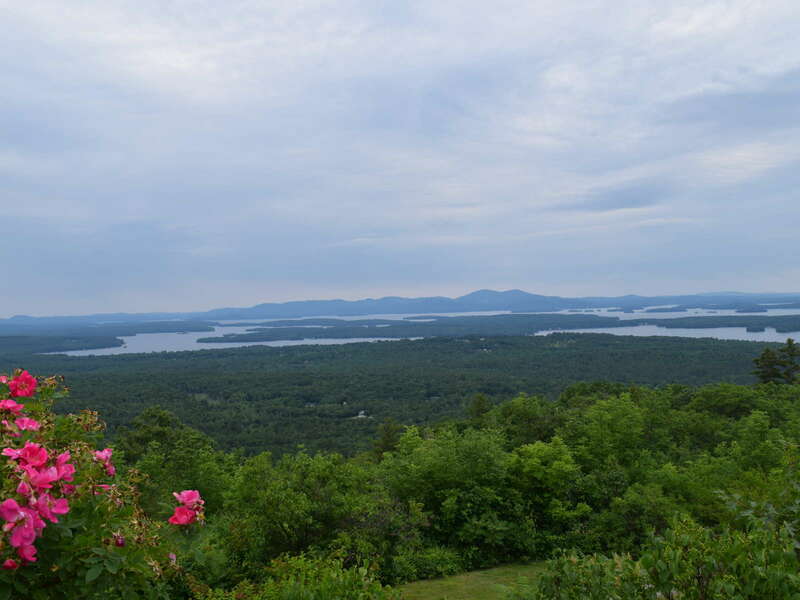 A taste of the spectacular view from The Castle in the Clouds. 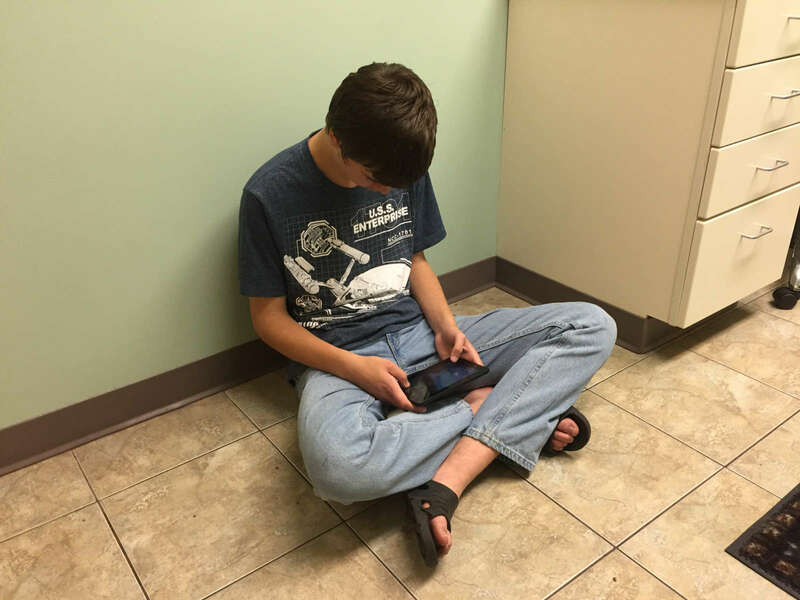 Danny sits on the floor in the vet's exam room, waiting for Ambush to come back from having her blood tests. Ambush fell ill on the 4th of July; we are still working on nursing her back to health. 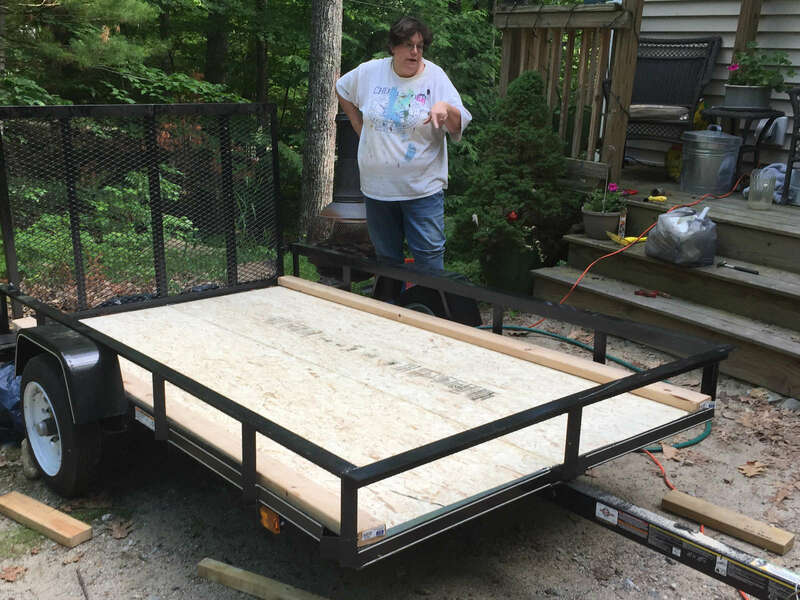 The camper has a floor! Not much, but it's a start, and with the ill-timed rain we've been getting, we'll take what we get. Karen frantically applies glue to attach underlayment to the floor. The stuff dries quickly, so we did half at a time. 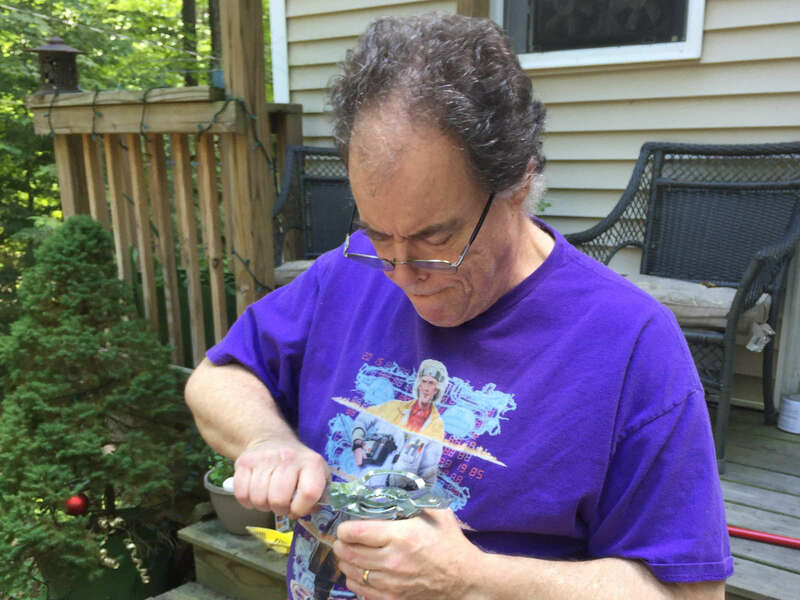 Gordon uses a jar-opening wrench to get the top of the glue for the underlayment of the floor for the camper. 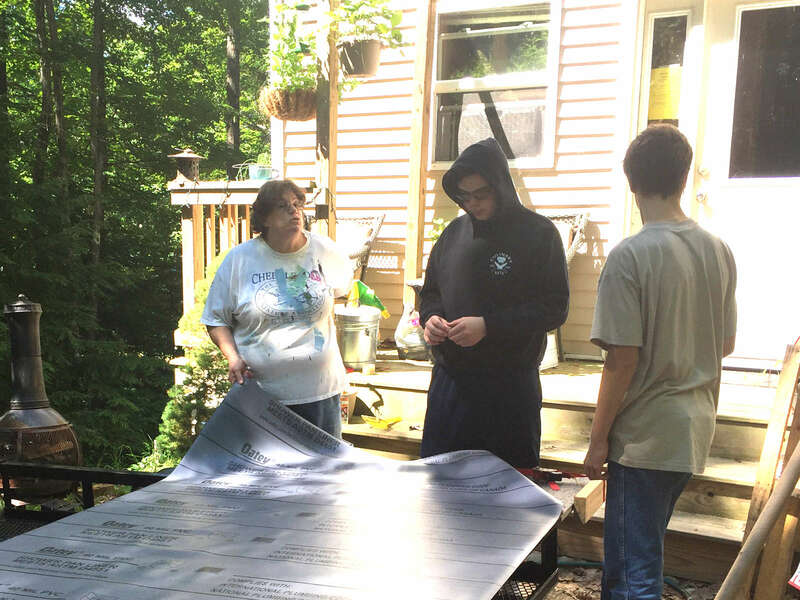 Karen, William, and Daniel fit the underlayment for the floor of the new camper. 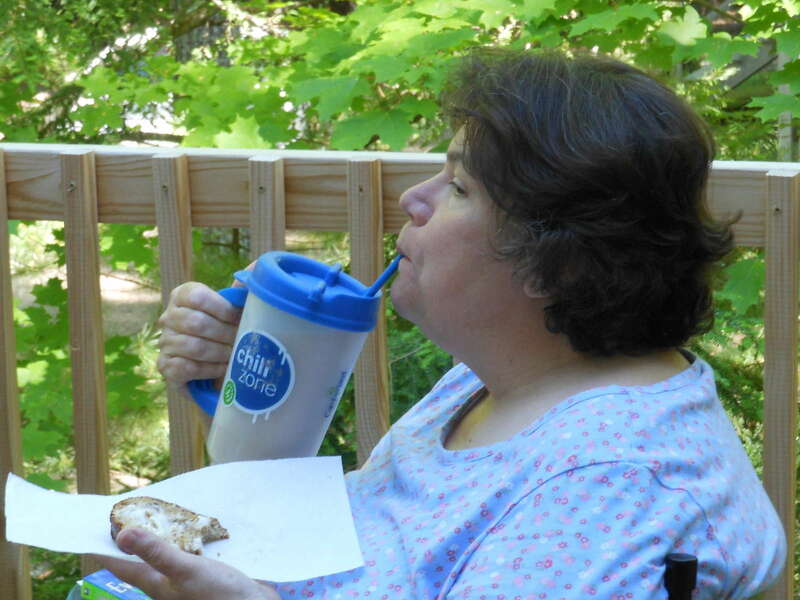 Karen enjoys a sip of coffee and some toast on the back deck, basking in the great weather, something we've had much too little of lately. 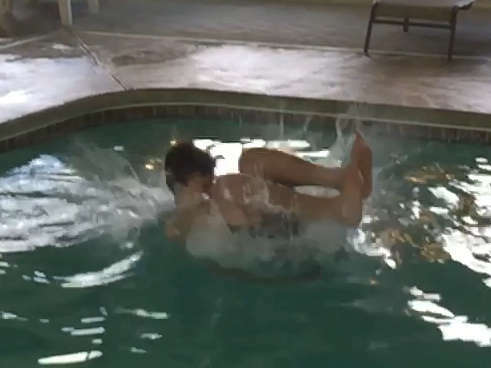 Click the picture to see a slow-motion jump into the pool by Danny. 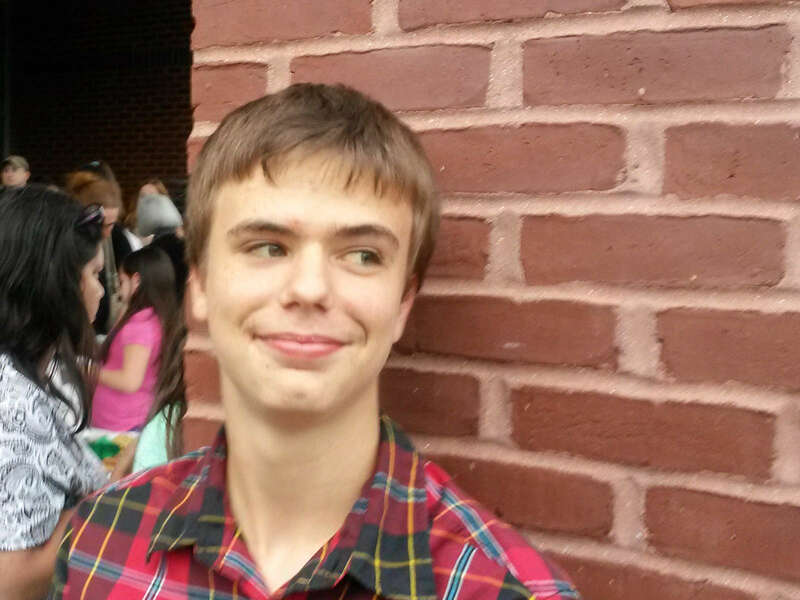 Danny hangs out for a moment at his promotion from eighth grade. 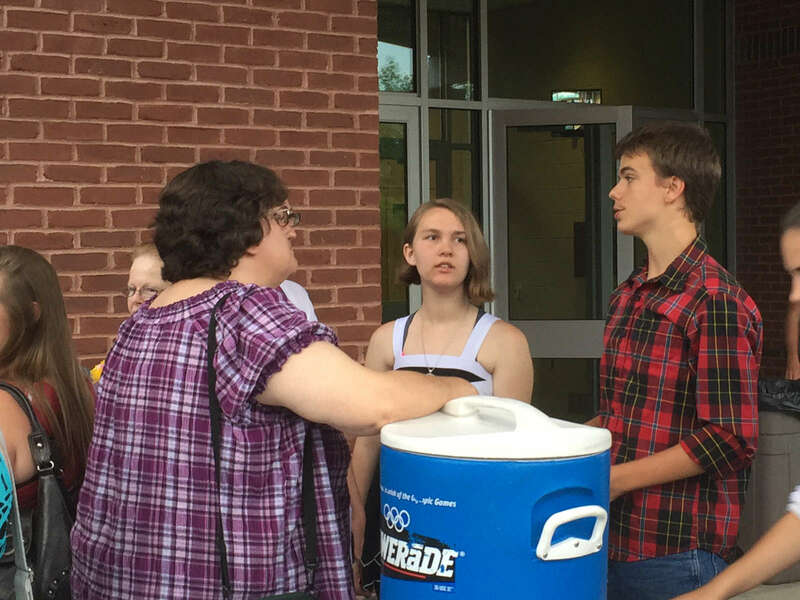 Karen and Danny have a chat with one of Danny's classmates after Danny's promotion from 8th grade. 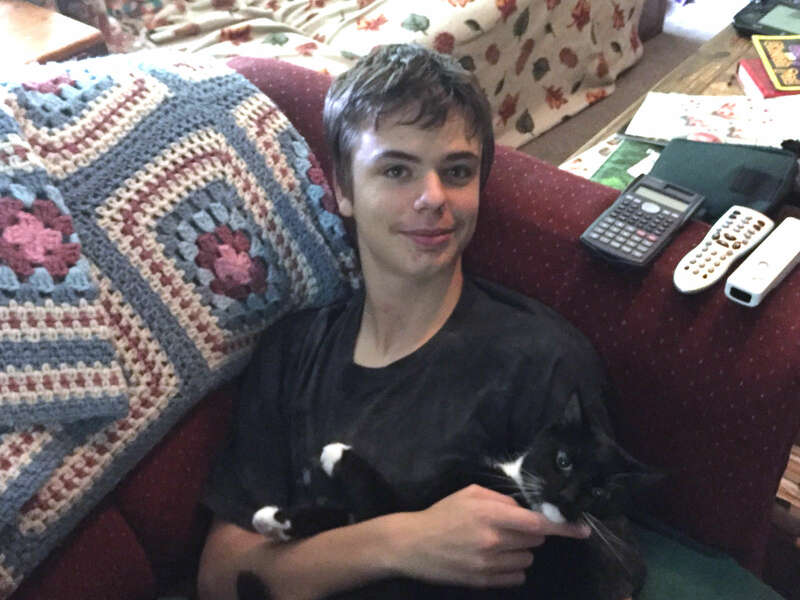 On to high school in the fall! 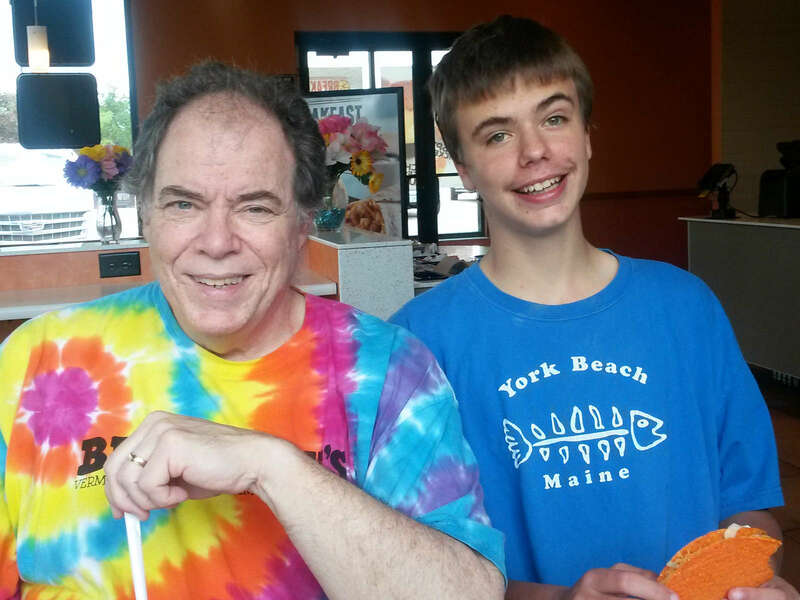 Lunch for Fathers' Day was Taco Bell; something else had been planned but the day just sort of got away. It's okay, though. Gordon likes Taco Bell! 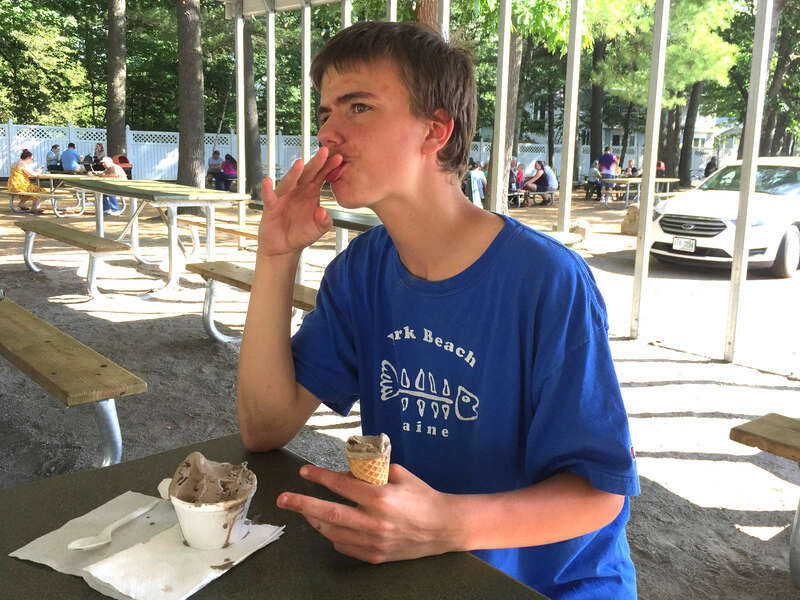 Danny licks his fingers to get every drop of the fast-melting ice cream we enjoyed during our Fathers' Day outing. 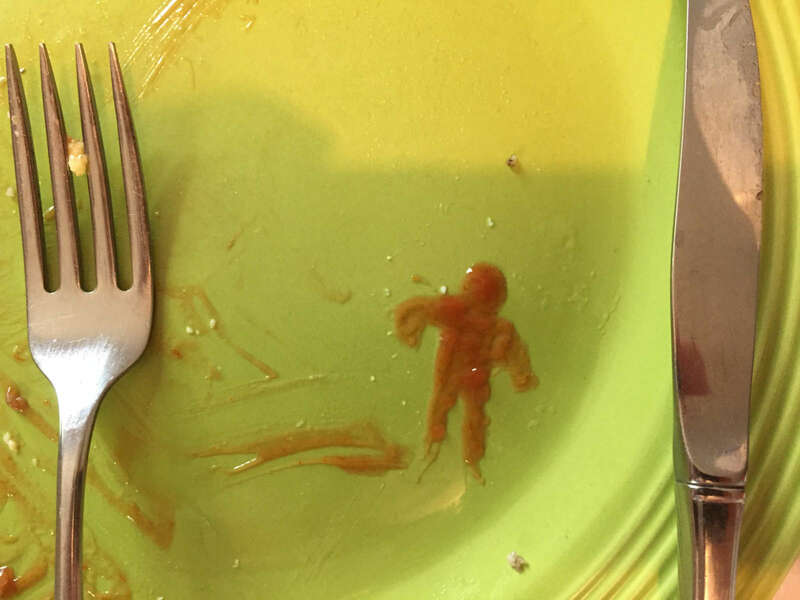 "Ketchup Man," a bit of accidental breakfast art by William. The only thing that's purposeful in this piece is the addition of the legs. 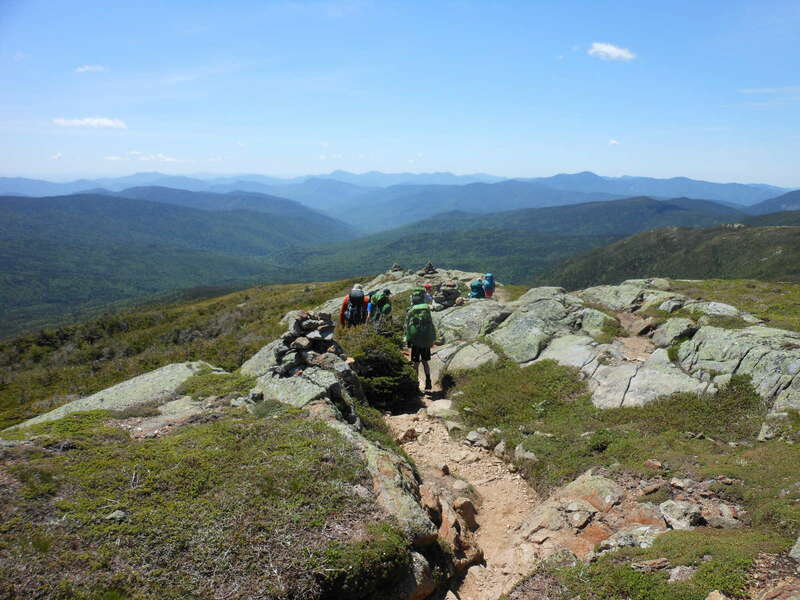 Danny's hiking group up in the White Mountains, in a photo taken by Danny. 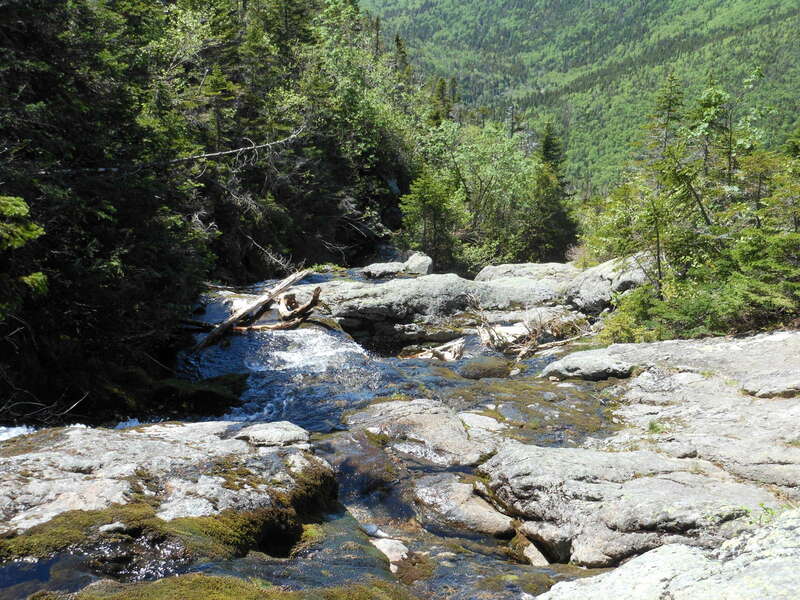 We hope to be getting some pictures of Danny from someone else in the group. 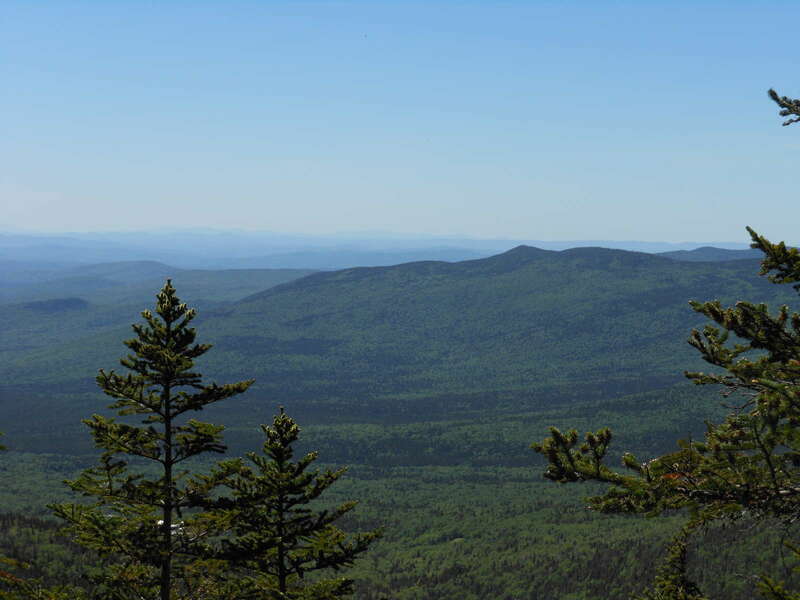 One of the pictures Danny took of the scenery in the White Mountains during his hiking and camping trip with his school team. 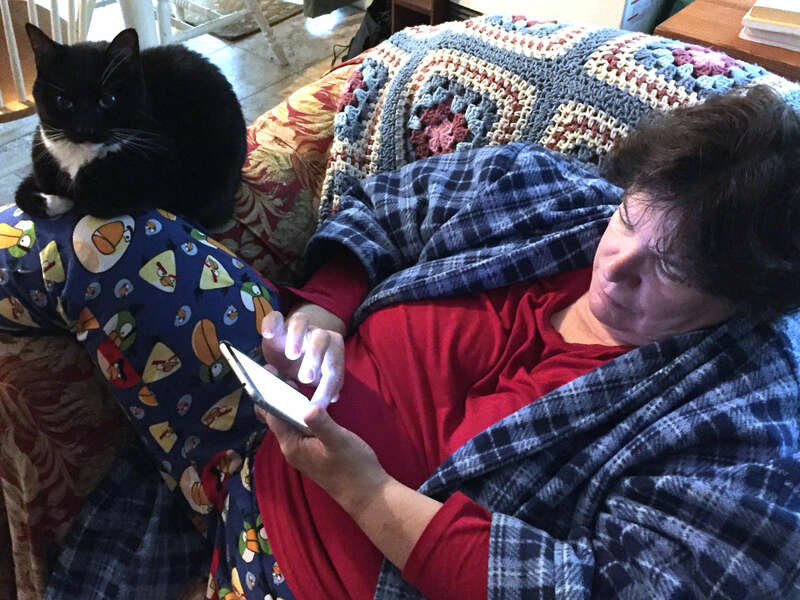 While Karen explores some recipes on her phone, Ambush uses her leg as a pillow. 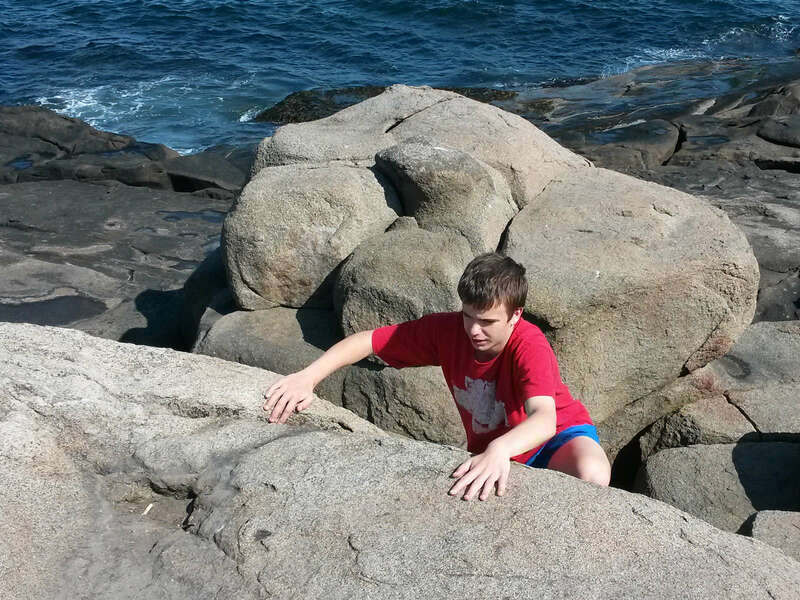 Danny climbs the rocks near the Nubble Lighthouse in York, Maine during a day trip with Karen. A conceptual art piece that Karen and I encountered at the Currier museum in Manchester. The camera captured us and turned us into part of the artwork. 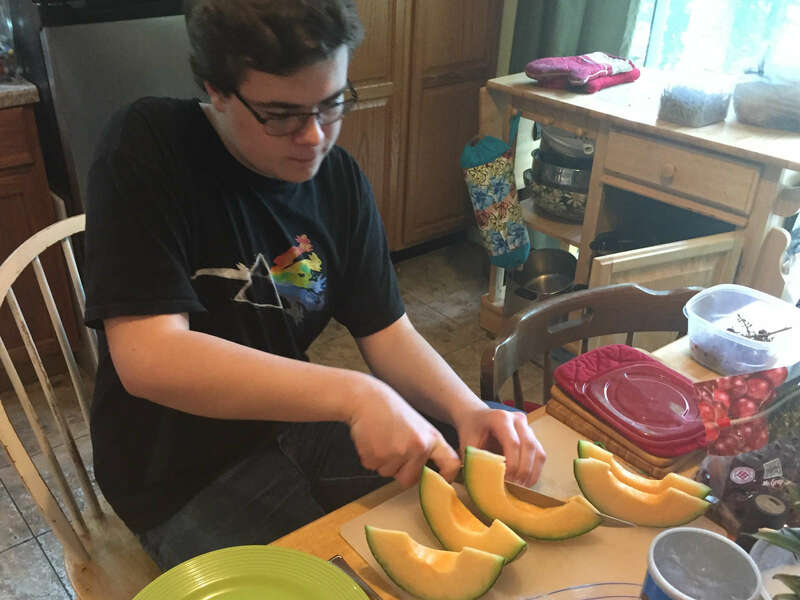 William cuts some cantaloupe for our breakfast. Now that he's such an expert at food prep (not being facetious here), he complains a lot about the quality of our knives. 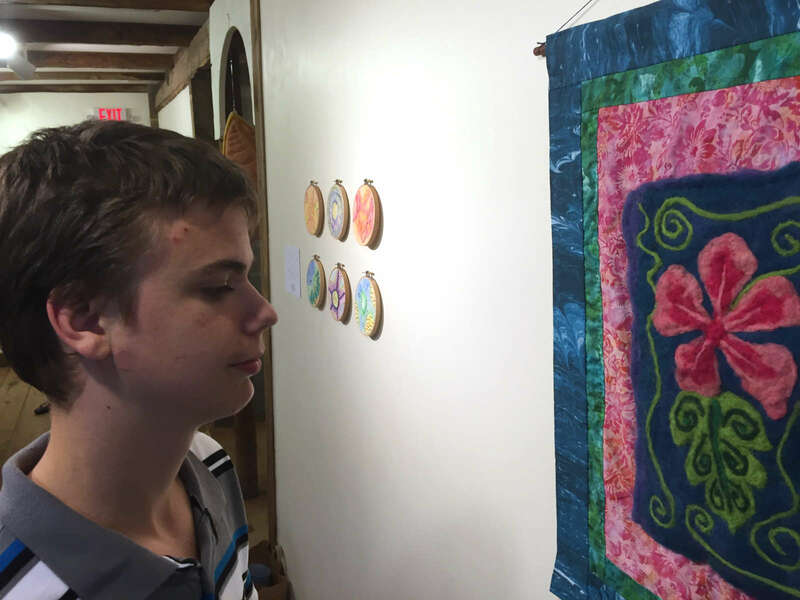 Daniel looks at a needle-felt art piece at a gallery reception that he went to with Gordon and Karen. 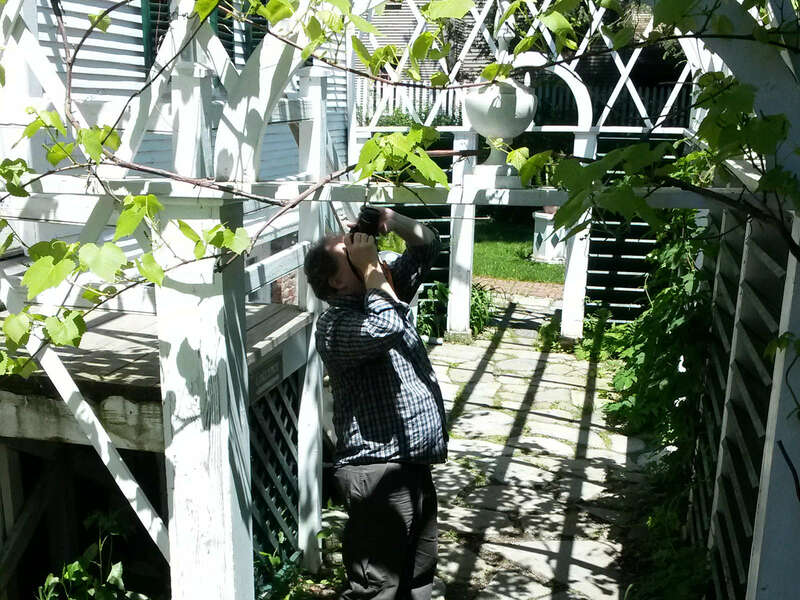 Gordon lines up a shot of the grapevines on the arbor at Strawbery Banke. 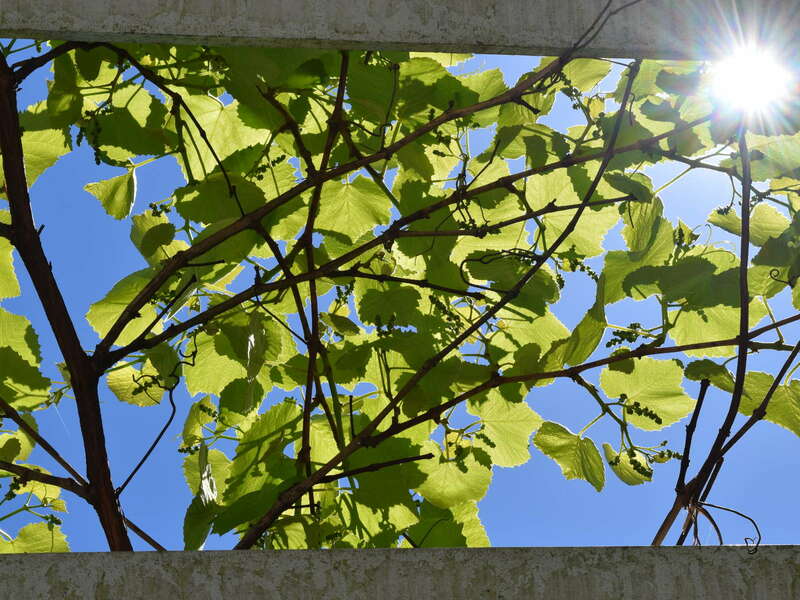 Gordon's photo of the grapevines with just a glint of sunlight. 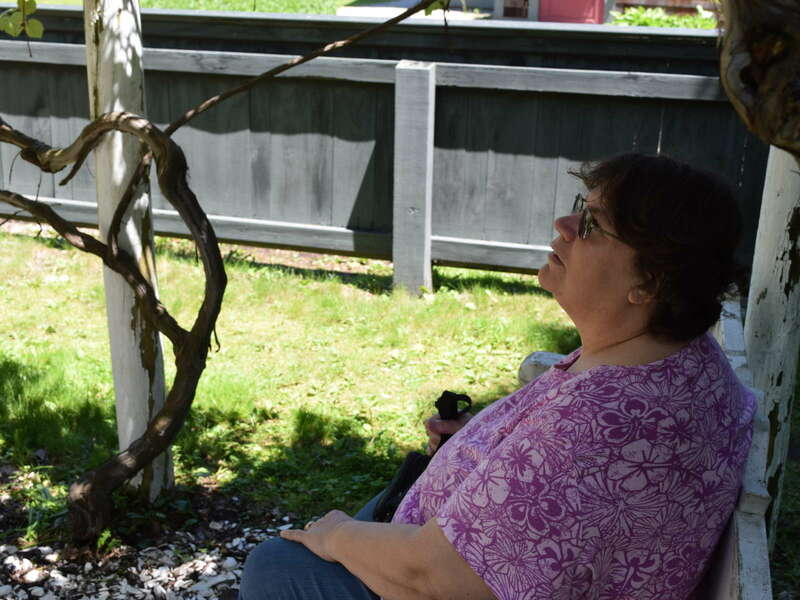 Karen relaxes under an arbor at the Strawbery Banke museum in Portsmouth, where she and Gordon got to spend time during one of their rare mutual days off. 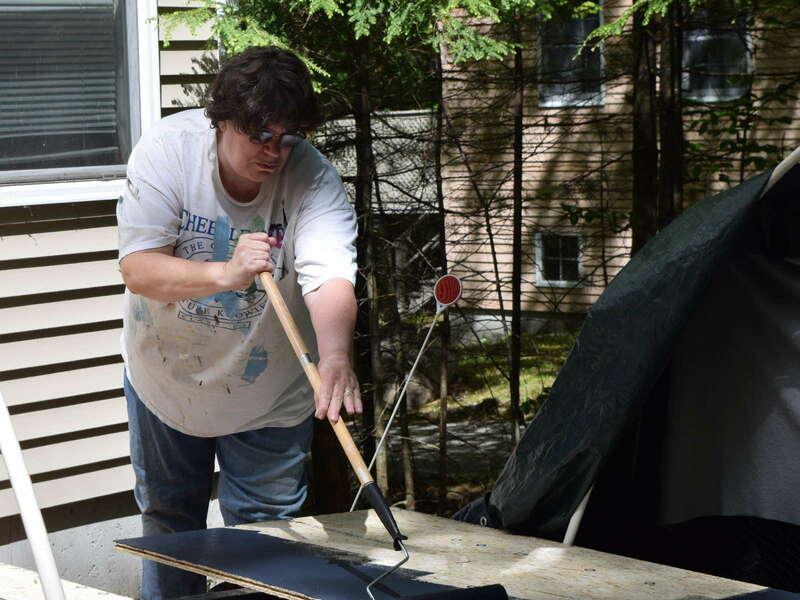 Karen paints the floor of the new camper with waterproof paint. 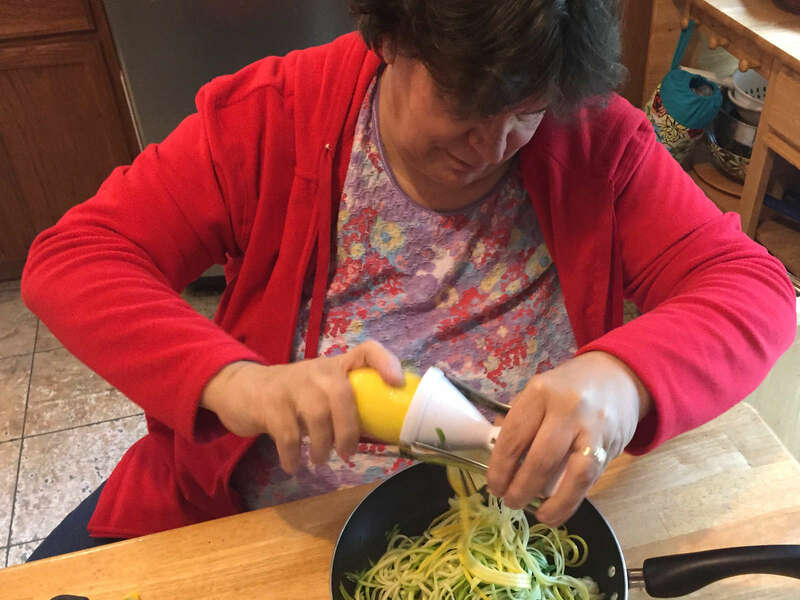 Karen turns some squash into a healthful spaghetti substitute using a handy little device called "Veggetti." A little animation of the "Vegetti" gadget at work. 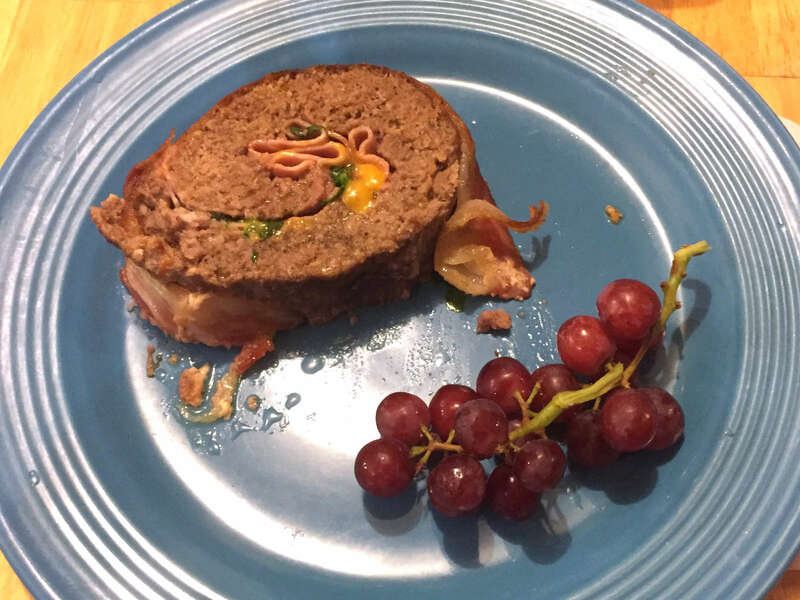 Something Karen found on Pinterest called a"bacon-wrapped burger roll." It has ground beef, ham, cheese, spinach, and bacon. It's yummy. 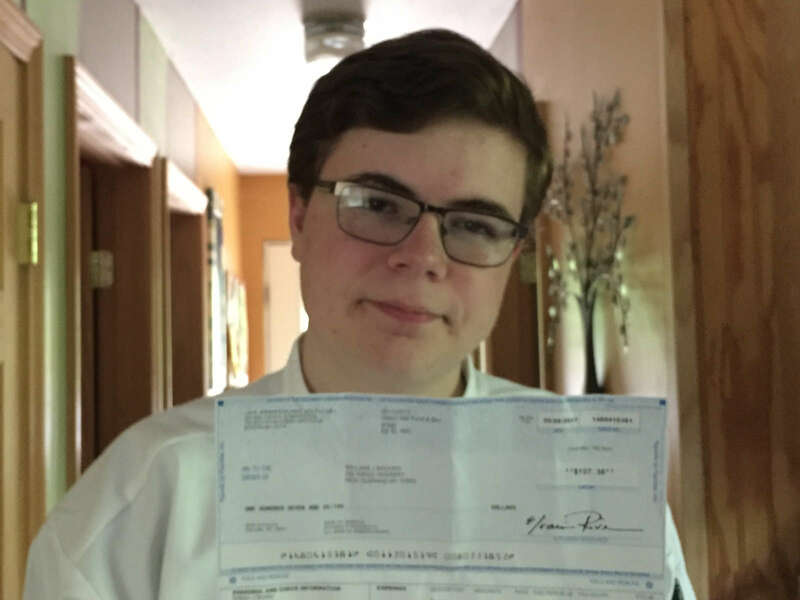 William shows off his first-ever paycheck, as he heads off for another shift at the club. 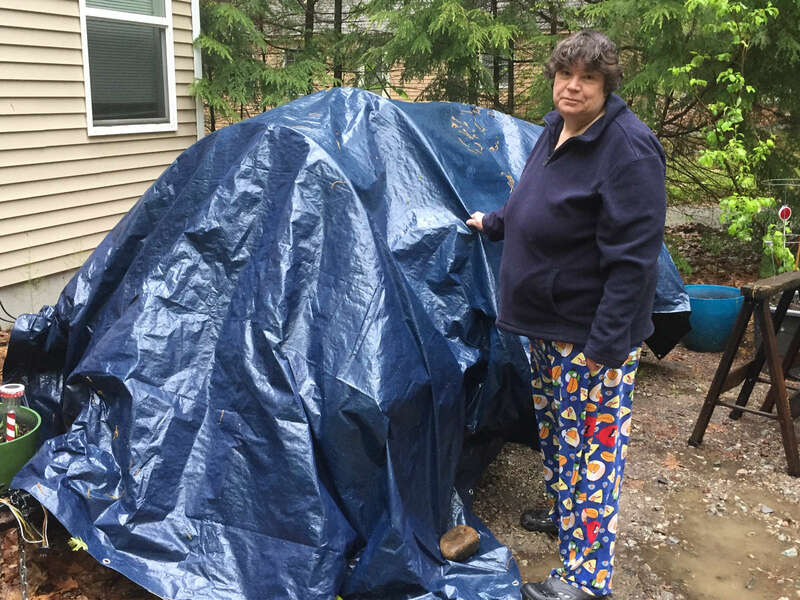 Karen trying to keep her new trailer dry, or more to the point, the wood stored inside it, which is waiting for a clear day that both she and Gordon have off to start the construction.